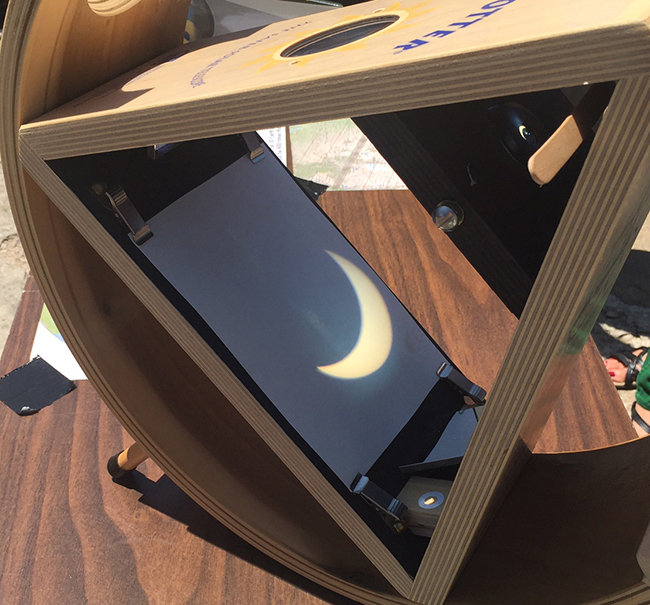 Visitors were able to see the quarter-moon shape of the sun through the shadow box set up outside Scales Hall. The first day of the 2017-18 school year at Southwestern Adventist University might have looked to some like the End of Days, but it was just coincidence that classes started today, the same day as America’s famous solar eclipse. 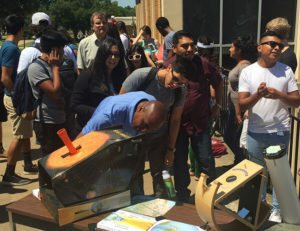 Even though Keene, Texas wasn’t favored with a total eclipse like much of the middle United States, students, faculty and staff were exposed to darkened skies, cooler weather and unnatural breezes at least for a few minutes along with 75 percent of the sun disappearing behind the moon for a few minutes. Tristan Mikesell set up his telescope between the library and Findley Hall, where curious students took photos of the rare event. 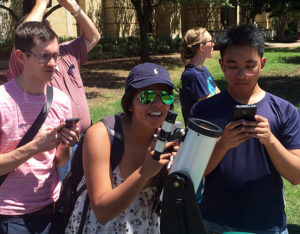 Faculty and students in Southwestern’s science departments worked with student services to provide special telescopes, sunglasses and pinhole boxes that allowed a crowd of people to safely see the sky show outside Scales Hall, on the rotunda, and between Chan Shun Centennial Library and Findley Hall. The crowd came and went from 11:30 a.m. until about 1:30 in the afternoon, with the peak eclipse coverage happening at 1:09 p.m.
Scales Hall faculty and students shared multiple ways for spectators to see the sky show.